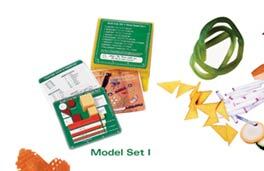 Our Knife Cuts Visual Model Sets offer three dimensional visual 3-D models that aid in the learning of various knife cuts. Our solutions meet the needs of beginning culinary programs to advanced hospitality programs. 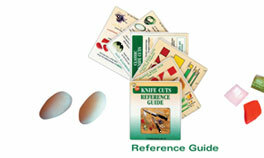 Click on any of the products shown below to get more detailed information and to purchase. 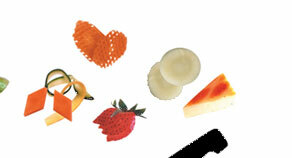 For high school and vocational school culinary programs (such as ProStart and C-Cap Programs). For Post-Secondary culinary hospitality schools and programs. 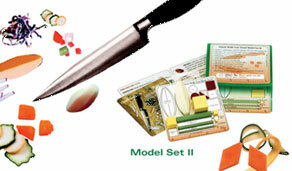 Second Edition - A comprehensive kit for ALL post-secondary culinary hospitality programs and schools. A unique multiple-page guide providing an array of innovative and helpful templates, descriptions and close-up photos of numerous knife-cuts. A handy two-sided ruler (12” x 4.5”) culinary reference & measurement tool.